Western horse saddles changed from the English ones with the addition of the horn. The horn at the front of saddle gave the cowboys more stability when they were roping cattle. The saddle also changed shape, it has a higher wooden tree to help absorb the shock of heavy riding. The back of the saddle is also higher to help prevent falls. Some saddles have stirrup flaps to protect the riders leg from brush they might encounter. Another piece of western horse tack is the breast collar. The breast collar attaches to the saddle on the sides and comes around the front of the horse. This is to help the saddle from slipping when riding. The western horse bridle plays a major role in how the horse is controlled. Western bridles use a bit to help control the horse. Generally a curb bit or a snaffle bit is used for finished Western horses and riders. The reins of the bridle are also different. Western horse tack is made for easier control of the horse, this is true for the reins as well. The reins are meant to be able to be controlled by one hand, connecting to both sides of the bit and joining together. Horse halters are used as well in western riding. A halter is worn by the horse when not being ridden, but may be training. The halter has one clasp for easy removal. 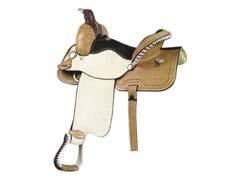 Western horse tack can be bought online, at tack shops, or from individuals. Buying used or discount horse tack is a great way to save money. As long as you make sure the tack is strong and in good shape, buying something that has been used is not a problem. It also saves time, you don’t have to work the leather. Looking for horse tack for sale is easy, the hard part is deciding what style you like.